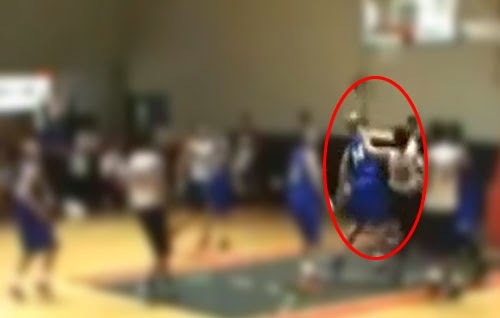 Video: Ryan Araña and Enrico Villanueva Brawl in tune-up game - Balita Boss! Rain or Shine guard Ryan Araña and NLEX Road Warriors forward Rico Villanueva were involved in a heated brawl during their September 25 tune-up game at the Meralco Gym in Ortigas, which resulted to cancellation of the match. According to the report of Spin.ph, the brawl happened less than 20 seconds in the first quarter. The video shows that Araña attempted a layup on a fastbreak and Villanueva gave a hard foul then the RoS guard threw the ball hard to NLEX forward. Villanueva made an assault in return by punching Araña in the face. Villanueva and Araña sustained bruises in their faces and bodies as they went after each other, trading punches then getting entangled in a virtual wrestling match on the floor, according to PhilStar.com report. Both teams left their benches immediately and ran to the hard court to pacify the two, but witnesses weren’t certain if any one had joined the fight. But according to PBA operations chief Rickie Santos, Luisito “Boy” Cruz, the PBA chief of referees, was right there on the sideline and had a video account of the brawl, and saw at least three throwing kicks and punches. “Boy saw at least three throwing kicks and punches. Then both benches rushed to the action. We’ll see in the video if they were there to help separate the protagonists or join the fracas,” said PBA operations chief Rickie Santos (via PhilStar.com). After the incident, Cruz had a teleconference with PBA commissioner Chito Salud who’s in Incheon, Korea. Salud is set to summon Araña and Villanueva for figuring in a fistfight ahead of the opening of the milestone PBA 40th Season on October 19, 2014.